Wherever you are in the northeast, chances are A.B. 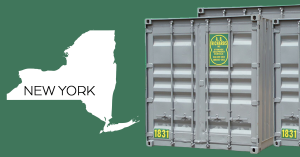 Richards can get a portable storage container to you. What you do with them is up to you. Whether you need them for personal use, business or industrial use, to keep equipment for construction site or to keep extra inventory, A.B. Richards has the storage container for you. We make storage easier by delivering your storage unit to wherever you need it and we’ll pick it up when you’re ready to return it. We want to take a look around New York State and show you how A.B. Richards can help you. Long Island is one of the country’s most renowned suburban areas with beautiful homes on tree-lined streets. You’d be hard-pressed to drive through Nassau County or Suffolk County and not see homes that are in the midst of a renovation. “For Sale” signs are another thing you’ll see from New Hyde Park in the west to Riverhead in the east. If you’re looking to do a major renovation in Massapequa or require storage space in anticipation of a move in Commack, then A.B. Richards 20ft storage containers are ideal. They can fit easily in smaller residential lots. Be sure to check out all our service areas! Westchester County is New York City’s northernmost suburb and it combines residential living with business and industry. Municipalities like White Plains, NY are centers of commerce. If you run a business and require extra space for inventory or you are in charge of a construction project and need to keep your equipment on a job site A.B. Richards can supply you with 40ft storage containers that are perfect for large storage jobs. As you move further north from New York City and Westchester, you will approach the beautiful Mid-Hudson Valley towards Rockland County, Newburgh, Poughkeepsie and beyond. There’s plenty to do here all year round. There’s camping in the summer and winter sports during the colder months. If you operate a seasonal business in the area, you’re going to need storage space to keep things in the off-season. If you have to store furniture or need additional space to store awkwardly shaped items for several months, your business can benefit from our 40ft Jumbo containers with an extra foot of headroom. Whether you live in the Big Apple or near an apple orchard upstate, A.B. Richards can make your life easier and give you the extra storage space you need at a fraction of the cost of commercial space. If you need to get organized, contact us today.